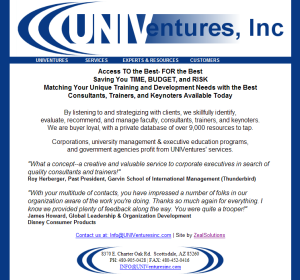 Zeal Solutions Custom Web Services - Portfolio / UNIVentures, Inc.
UNIVentures, Inc. has a database of thousands of qualified faculty and consultant profiles. UNIVentures search these profiles to recommend specific experts to businesses and universities who are looking for the services of top external consultants, faculty, and trainers worldwide. 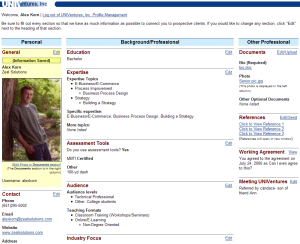 Previously, UNIVentures updated these profiles manually, including attaching biographies, course outlines, and photos. They wanted the ability to allow these consultants to update their own profiles. UNIVentures faced some barriers with their searching capabilities. They wanted to be able to search more precisely based on criteria. As in any business that relies on emailing people, they often encountered bounced emails. We redesigned their database so that it could be available online, giving their contacts password-protected access to their information so that they could conveniently update their own profiles as needed. While redesigning the database, we created ways of saving more in-depth information in the profiles to more precisely match the contacts to specific client requests. We created a system to automatically capture bounced emails and put them into a list of bad emails to research and correct. We also created many other improvements to their system. For example, we created an automatic reference system where contacts could send out references to their previous clients that would be automatically collected and entered into their profile. We communicated remotely through email and telephone. Early versions of the website were set up where only the client could see them so that the client could comment on the site design and functions.